The SDG Leadership Forum for Goal 17 was hosted by Unilever and GlobeScan on Wednesday 14th March 2018. In this live, online discussion, we explored how to create new forms of partnerships and scale up innovation to unlock progress on the SDGs. We were joined by expert guest contributors as well as over 300 participants from 39 countries around the world. 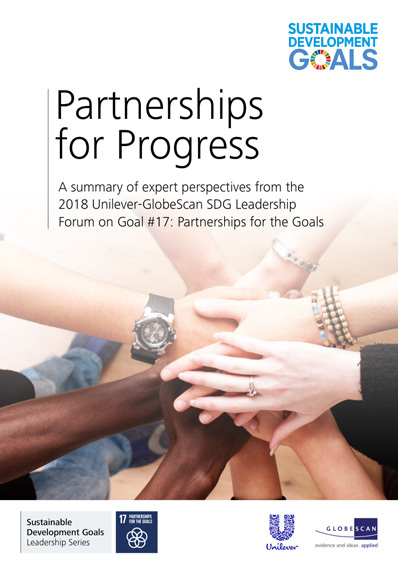 Our report “Partnerships for Progress: Perspectives from the 2018 Unilever-GlobeScan SDG Leadership Forum” is available for download here. You can still access the discussions by logging in on the right hand side and then clicking on each of the discussion topics. This event was the first in GlobeScan's SDG Leadership Series. To find out about the other events in the Series please visit GlobeScan's website here. The 2030 Agenda for Sustainable Development is ambitious and the SDGs can only be achieved if we work in collaboration. This requires inclusive partnerships – at the global, regional, national and local level – between governments, the private sector and civil society, built upon a shared vision and shared goals that place people and the planet at the centre.